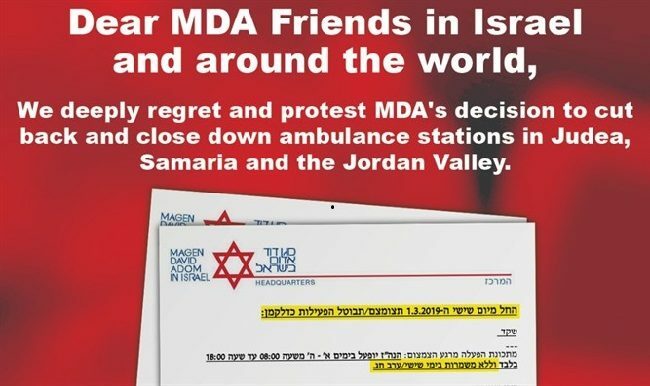 Earlier this week the Yesha Council applied pressure with an appeal to American Magen David Adom (MDA) donors to not allow ambulance stations to be closed. The Yesha Council planned to post ads concentrating on Jewish media in America. 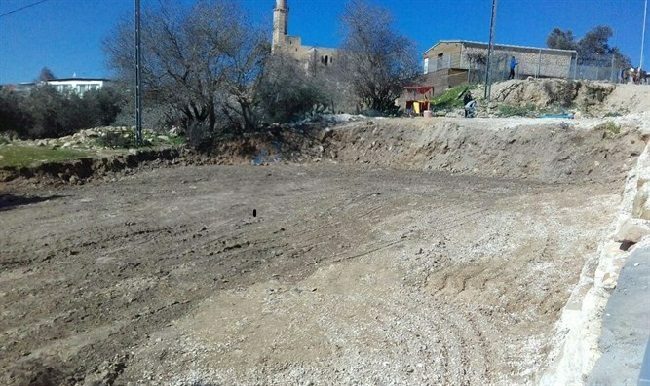 MDA’s planned closure of ambulance stations in Judea, Samaria, and the Jordan Valley this weekend would have left these large areas without adequate emergency medical care. AFSI is happy to report that MDA has since decided to suspend their decision, at least for one month. A source of national pride for Israel, this historic endeavor of Space IL’s launch is privately funded. It will also be the least expensive launch to the moon paving the way for commercially viable travel to the moon. Successful lift off from Cape Caneveral, Florida took place Thursday night. Beresheet spacecraft was placed in Earth orbit, then begins a seven-week trip under its own power to reach the Moon and touch down on April 11 in a large plain. Keeping track: Beresheet successfully completed its first maneuver toward the moon after detaching from its launcher and completing its planned orbit of Earth. On this same subject, we like Rabbi Michoel Green’s Arutz Sheva OpEd. A gate serving to block the entrance of a section of the Temple Mount closed by Israel since 2003, has been removed by PA protestors. This recent “flare-up” does not bode well for Israel and shows a”chipping away” of the Temple Mount for the Jewish people. Will Israel assert itself as having rights to control this area of the Temple Mount? Or will the status quo remain? This latest calculated move was initiated by the new and more radical waqf council writes Nadav Shragal. Their goal is to challenge Israel’s closure of this site so it can reassert its control over the entire Temple Mount compound. The status quo cannot continue. Israel must enforce its legal rights at the Temple Mount. The most recent news tells us that Israel has arrested two senior Waqf official. Jerusalem Post report HERE. A reminder to our readers that HALIBA is the Israeli umbrella organization working “to re-claim for Jews the basic civil rights of free access, free worship, and free congregation on the Temple Mount.” HALIBA is an acronym for Hebrew, HaMeizam L’Khofesh Yehudi B’Har HaBayit – The project for Jewish freedom on the Temple Mount. 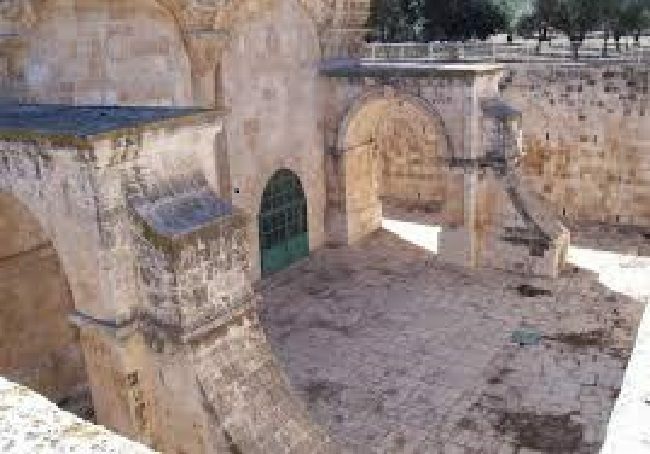 Often referred to as The Temple Mount Heritage Foundation, it is led by its founder Yehuda Glick. The Israel Independence Fund (an organizatiion AFSI is closely aligned with) works with HALIBA to promote full Israeli sovereignty on the Temple Mount. The Talk of All Israel: Sovereignty! 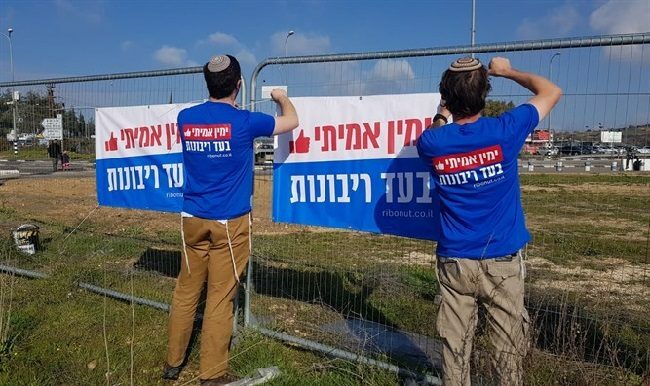 Billboards that read “The true Right supports Sovereignty!” are being put up all over Israel!! 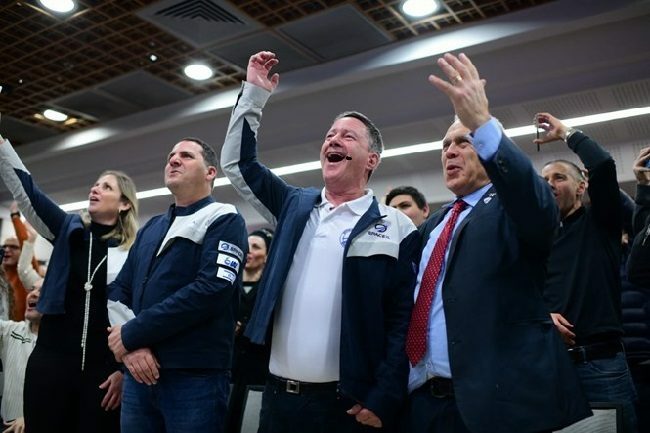 This campaign is to encourage voters in Israel’s upcoming elections to support parties committed to the vision of Israeli sovereignty over Judea and Samaria. Women in Green leaders Yehudit Katzover and Nadia Matar emphasize the campaign is unaffiliated with any specific party and that no political officials on behalf of any party are behind it. US Congressmen Dr. Andy Harris (R-MD) and Andy Barr (R-KY) visited Oz V’Gaon this week. Katsover and Matar spoke to them about the establishment of the reserve as a Zionist response to the 2014 murder of three teens and especially the importance of applying Israeli sovereignty over Judea and Samaria. Read about what was said HERE. Poland withdrew from the Visegrad Group (V4) summit in Jerusalem in protest of comments on Polish anti-Semitism by Israel’s newly appointed Foreign Minister Yisrael Katz. Hananel Dorani and Yigal Dilmoni are chairman and CEO, respectively, of the Yesha Council, the umbrella organization of municipal councils of Jewish communities in Judea and Samaria. 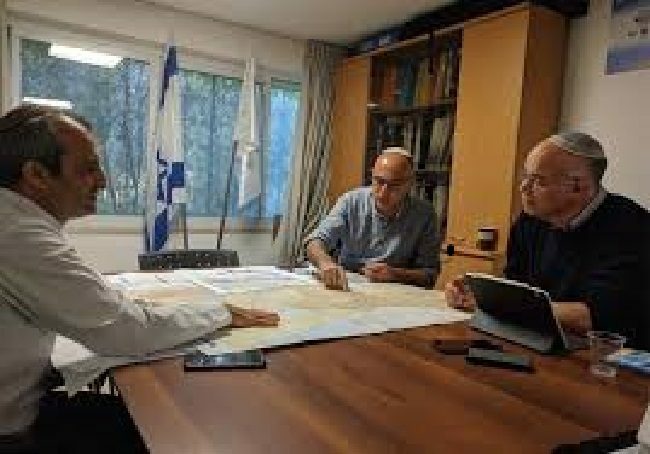 Within the next ten years, Dorani and Dilmoni’s ambitious master plan is to see the Jewish population in Judea and Samaria double. The goal: one million; current number 450,000. They say that a population increase to one million would have a large impact not only for local area residents, but for the population of the State of Israel as a whole. 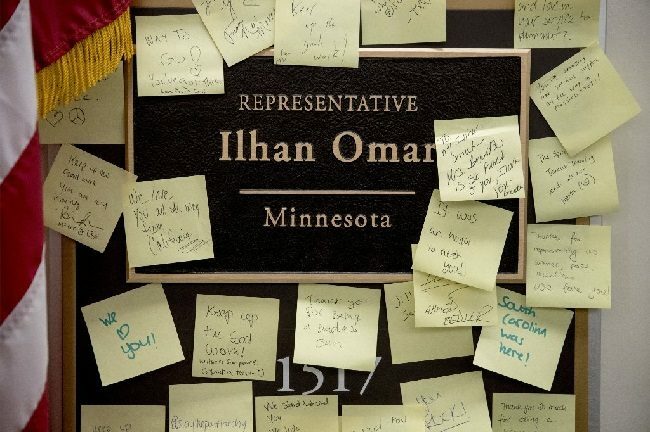 “What she said is so deep-seated in her heart,” stated President Trump when asked to comment on Senator Omar’s anti-Semitic rants. AFSI thanks the President for speaking the truth in support of Israel and the Jewish people. Watch him speak HERE. THANK YOU to everyone who heeded our ACTION ALERTS and called out Omar for what she is: Anti-Semitic. Your efforts matter and together we can go even further in effecting change! 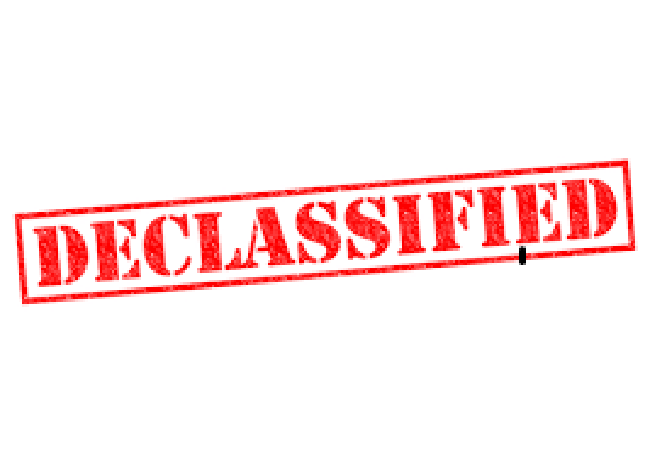 Read the declassified document HERE. “We will not avert our eyes from a regime that chants death to America and threatens genocide against the Jewish people. We must never ignore the vile poison of anti-Semitism, or those who spread its venomous creed. With one voice, we must confront this hatred anywhere and everywhere it occurs.” ~~ President Donald J. Trump in his State of the Union address on February 5, 2019. Pictured here is Judah Samet, a fitting guest at Tuesday night’s speech. Samet is a Holocaust Survivor and a survivor of the Tree of Life Synagogue massacre in Pennsylvania. 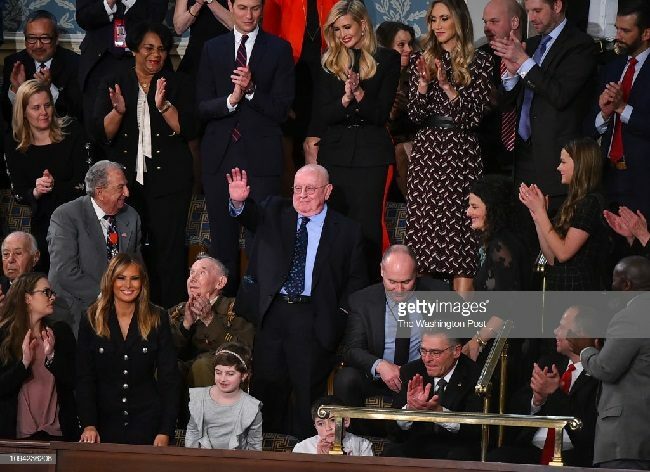 Samet received a standing ovation after he was acknowledged by President Trump. President Trump announced this week his appointment of Elan Carr as the US State Department’s Special Envoy to Monitor and Combat Anti-Semitism. Carr’s background is quite impressive, especially his history of leadership in working to fight anti-Semitism on college campuses. We think he is highly qualified to fill this very critical position. 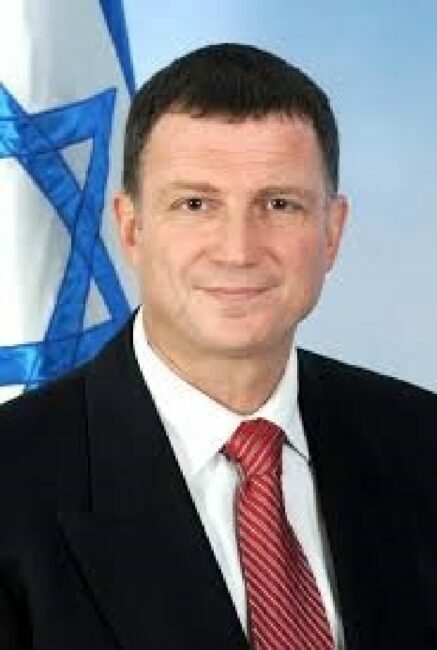 Read about Carr’s extensive background in The Times of Israel report HERE. Late Wednesday afternoon, the US Senate approved in a 77-23 vote a bill that codifies $38 billion in defense assistance to Israel and also provides legal cover to states that target the BDS movement. The “Combating B.D.S. Act.” was co-written by Senators Marco Rubio and Joe Manchin. While the bill was waiting on the Senate floor for a vote, Senator Rubio’s Opinion in The New York Times, “The Truth About B.D.S. and the Lies About My Bill” was published. We encourage you to read it.